Christmas is less than 2 weeks away, the tree is up, the house is decorated and the street is filled with bright lights and Christmas cheer, but have you got all of your presents yet? Well here’s where Wineware come in, we’ve listed our top 5 last minute stocking fillers (all priced under £20) which are all easy to wrap, vital if you’re in a rush or leaving it until the last minute! From official Whisky glasses to wine bottle protection bags and a handy corkscrew to superb beer glasses! Don’t forget, you’ve got until 12 Noon on Friday 20th December to place your orders for guaranteed pre-Christmas dispatch! The superb Glencairn Official Whisky Glasses are hugely popular and are found in the World’s greatest whisky bars, top hotels and distilleries. 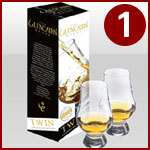 This set of 2 glasses is supplied in an attractive printed gift carton, making it a great gift and stocking filler for any budding whisky drinker, new or old! 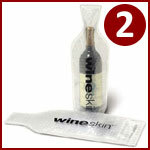 The WineSkin protector bags are ideal if you’re transporting bottles of wine, whisky and other glass bottles in luggage, whether it’s in a bag or a suitcase. The WineSkin is designed to protect the bottle from impact, but if the bottle were to break, no liquid or glass will escape and spill into your bag and ruin your other possessions stored within the bag. The Vinology Decanter Drainer allows you to place your wine decanter (once washed and cleaned) on the stand to drip dry. The stand is collapsible once used, meaning it’s great if you’re tight on storage space. 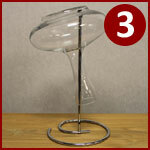 It’s easy to put together and dismantle…the perfect accessory to maintaining a clean wine decanter! The popular Beer Classics range from Spiegelau covers all sorts of different beer types, from Lager to Wheat Beer and IPA (Indian Pale Ale) to Pilsner, these glasses will really enhance your beer drinking experience. 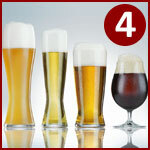 The entire Spiegelau Beer Classic range of glasses is supplied in sets of 2 in colourful gift packaging. This handy, easy to use classic waiter’s friend corkscrew has a double lever allowing you to easily withdraw the bottle from the cork! This type of corkscrew is great to have for picnics down the park or in the garden; every kitchen drawer should have a waiter’s friend corkscrew! 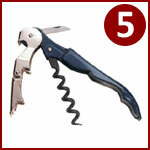 It comfortable sits in the pocket and it plays an essential part of opening your favourite bottle wine!